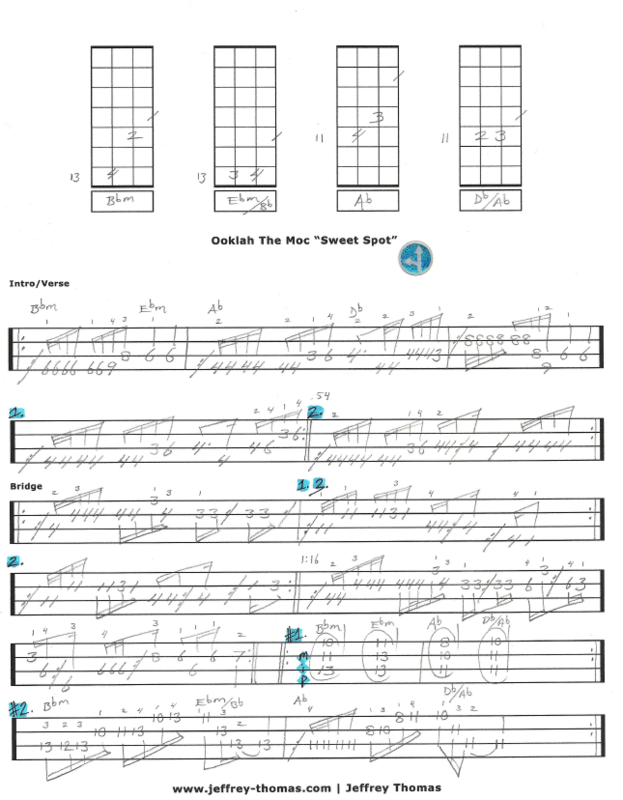 Learn to play this great reggae bass line from Ooklah The Moc’s “Sweet Spot.” I have both free tab and video for this tune. The bass line has a reggae feel with 32nd & 16th note bounce and the lesson walks you through the tune structure, include time markers for intro/verse, bridge transitions and demonstrate the technique involved. A additional “Block Chord”study example using Bb Minor, Ebm/Bb, Ab and Db/Ab as well as a single note line running through the same chord progression. Want the full bass tab for free? Just send in your email address using the form provided. Looking for online reggae bass lessons? Fill out the Schedule A Free Lesson form to set up a free Skype bass lesson today. From Oahu, Hawaii this band plays roots dub reggae and the bass is just awesome! I hope you enjoyed this free video bass lesson with tab. Check into my online bass tab archive for more cool bass material.